The famous pop band RBD that is composed by the six young charismatic vocalists that power RBD - Anah�, Dulce Maria, Maite, Christopher, Christian and Alfonso(who goes by the nickname "Poncho"), will concert in Acapulco Our school is planning a visit to Mexico City for the summer holiday for all kind of ages. But hurry up!!! We have places for only 60 pupils. The famous pop band RBD that is composed by the six young charismatic vocalists that power RBD - Anah�, Dulce Maria, Maite, Christopher, Christian and Alfonso(who goes by the nickname "Poncho"), will concert in Acapulco. ...read more. Set opposite Chapultepec Park, it is surrounded by Mexico's finest museums and is just a short walk to the Zona Rosa and Paseo de la Reforma. This 8-acre complex is like an oasis in the very heart of Mexico City. The famous pop band RBD that is composed by the six young charismatic vocalists that power RBD - Anah�, Dulce Maria, Maite, Christopher, Christian and Alfonso(who goes by the nickname "Poncho"), will concert in Acapulco The main point will be the visit to Xochimilco; it is one of the sixteen delegaciones within Mexican Federal District. 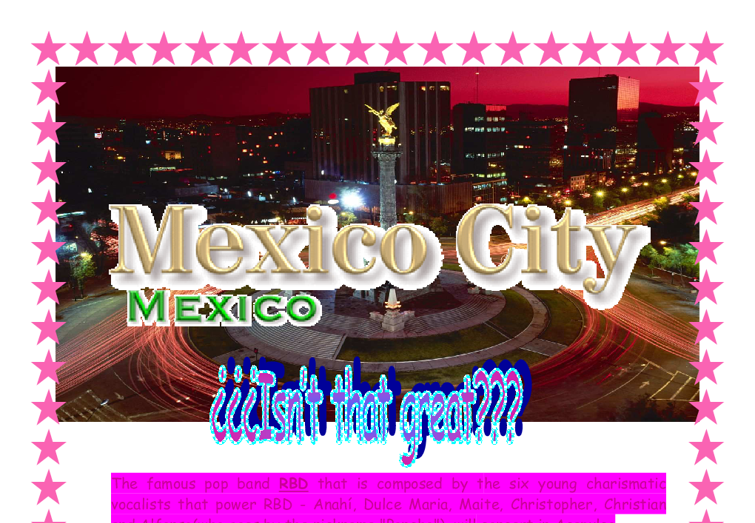 It is located south from Mexico City. ...read more. last 4 days we'll also visit a little Acapulco, Cuernavaca, Taxco and Oaxaca; here we'll pass the nights in those 6 busses of the "Camino Real" hotel, that have extensible beds. The cost will be about 750� per pupil, including all travel and accommodation. If you are interested, please let your details at the phone number: 005643321547, or send us an e-mail at: mexico_travel@highschool.com until 23 April. Please check with your parents before you sign up for the visit. The famous pop band RBD that is composed by the six young charismatic vocalists that power RBD - Anah�, Dulce Maria, Maite, Christopher, Christian and Alfonso(who goes by the nickname "Poncho"), will concert in Acapulco ?? ?? ?? ?? ...read more. immediately because the public cares more about the environment or poor people or the animals. There are many types of media which charities advertise their organisations on, for example, television, radio, billboards, print media, etc. On television we see the conditions of place where people live and sleep. Marketing Advisor's report - the Orchard Country Hotel. Can you start a business up whilst working? Do you have good time management skills? Have attended any small business development course? Have you read any start up guides? Raising finance: Funding options. What type of capital? Banks. Grants and free help.